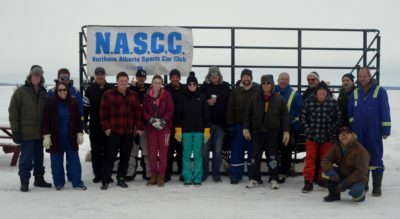 The Northern Alberta Sports Car Club (NASCC) announced the NASCC 2019 Ice Racing Season. 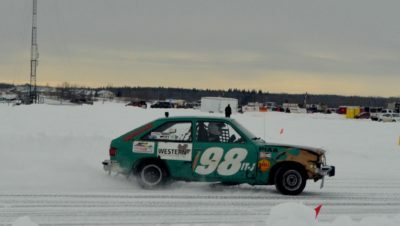 Ice racing cars don’t require as much equipment as many other types of racing and for that reason it can be one of the most cost-effective types of racing around. 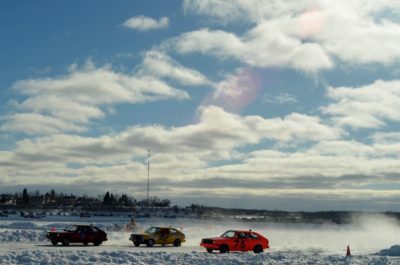 Aside from standard safety equipment and winter tires you need an approved helmet, proper winter clothing and an ice racing licence. 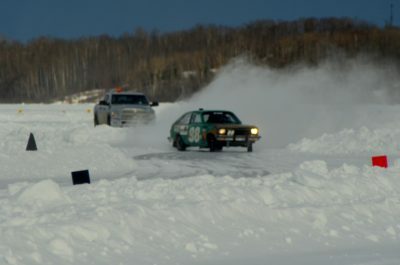 Licenses are available at the Winter Driving and Ice Racing School offered by the NASCC. 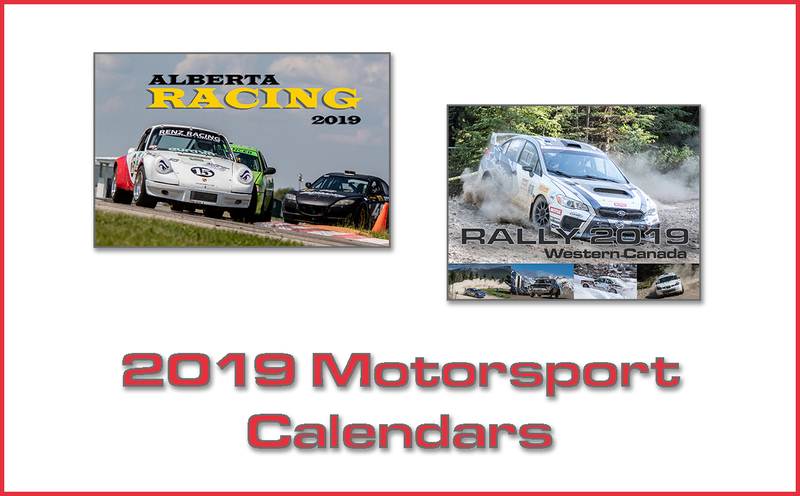 They offer a course which involves both classroom and track time, and is one of the best deals in racing I have seen. 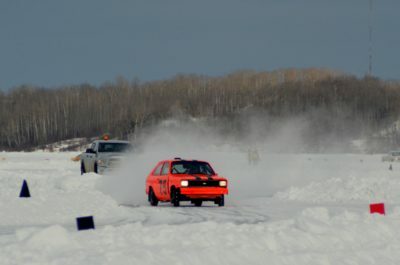 NASCC has different race classes to choose from, for almost any car with safety equipment. 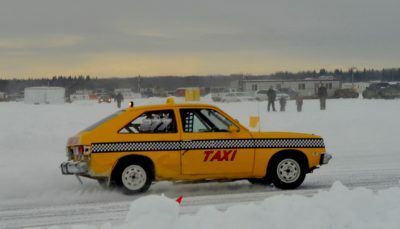 One of the biggest difference in these classes are tires, Studded & Non-Studded (Rubber to Ice). 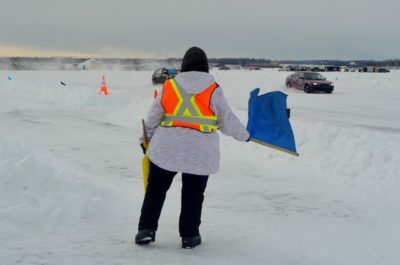 Ice racing marshals are the Diehards of Motorsport marshalling! The best way to watch a race is to be in the car. The second-best way to watch is to be a trackside marshal. 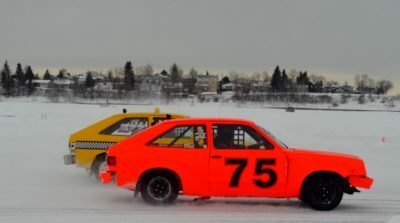 If you are interested in racing but not sure about driving yourself, being a marshal might be for you. 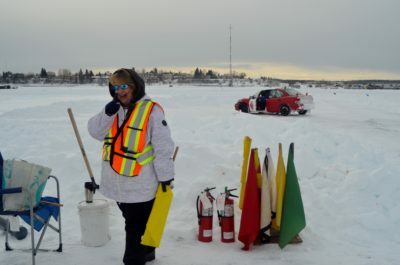 Ice Racing Marshals are there for emergencies and to communicate with racers with flags and to communicate regarding the race with others via radio. 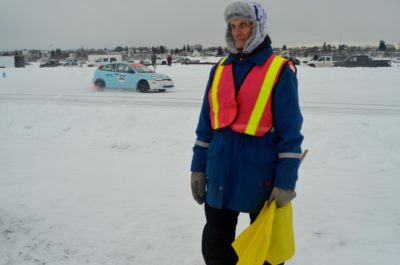 What to expect as an Ice racing marshal: The first thing you need to expect is to dress warmly. 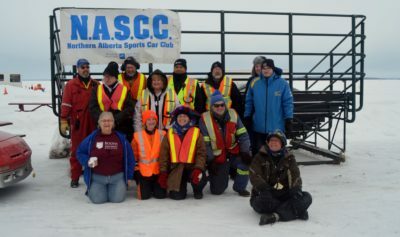 Temperatures in Canada and Alberta while marshalling can be anywhere from -5 to –40 Celsius depending on where you are; so dress warmly in lots of layers. You can always shed a layer of clothing if it warms up. Try wearing any other colour except white so you don’t blend into the snow bank. 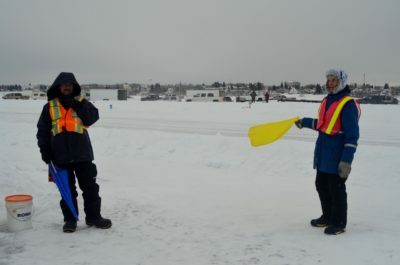 If you are new to Marshalling you are on track training with experienced personnel. An average race course is 6 turns and approximately 2 kms long so 20 trackside marshals can cover a racecourse. Track set-up starts with checking ice thickness for safety first then followed by ploughing out the course. You must be 18 years of age to be trackside but if being trackside is not for you there is many other volunteer jobs required to run a race. Non-trackside race positions: timing, pre-grid Pit in & Pit out, Tech, track set-up & clean-up. 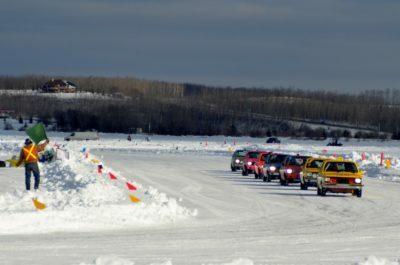 Events are based on weather permitting & ice conditions. 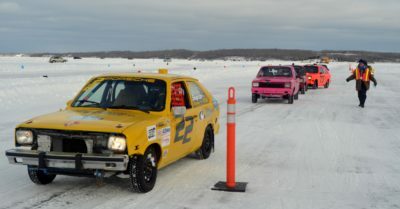 Weather conditions may cause Ice Race date changes, so all other weekends between these dates are alternate dates. 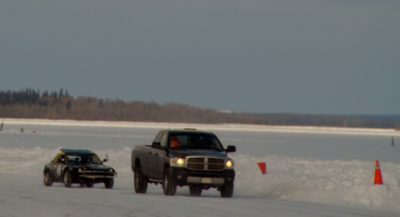 The planned lake for Ice Racing this year again will be Roy’s Lake by Stony Plain except for the Lac La Biche event. 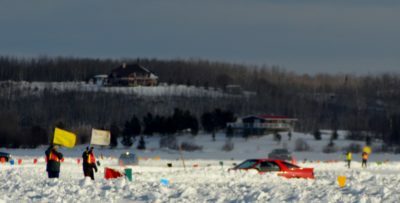 Winter Driving and Ice Race School registration is open on the MotorsportReg website. Friday, January 11th there will be a classroom session and Saturday, January 12th it will be all day on the ice with individual instruction. 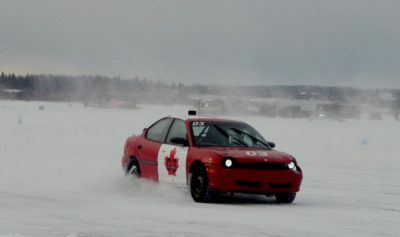 The School is mandatory for anyone new to Ice Racing. Please share this information with Family and Friends as we expect to sell out the school again this year, so register early!. The School also makes an excellent Christmas present for a young driver in your family. 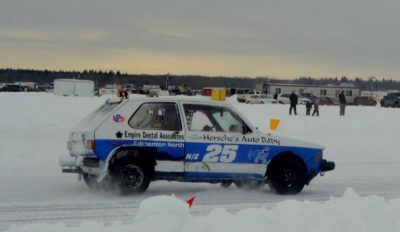 The specified Bolted Tire hardware for Chevette or Limited Stud is available for purchase through the Club at a subsidized price of $1 per unit (nut, bolt and 2 washers). Contact Mark Burrough m.burrough@shaw.ca to obtain. The NASCC also has the Club’s tire shaving machine available for use, if you need to use it please contact Mark Burrough.